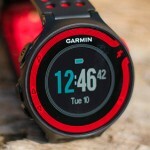 Both Forerunner watches are made for running and support little else. 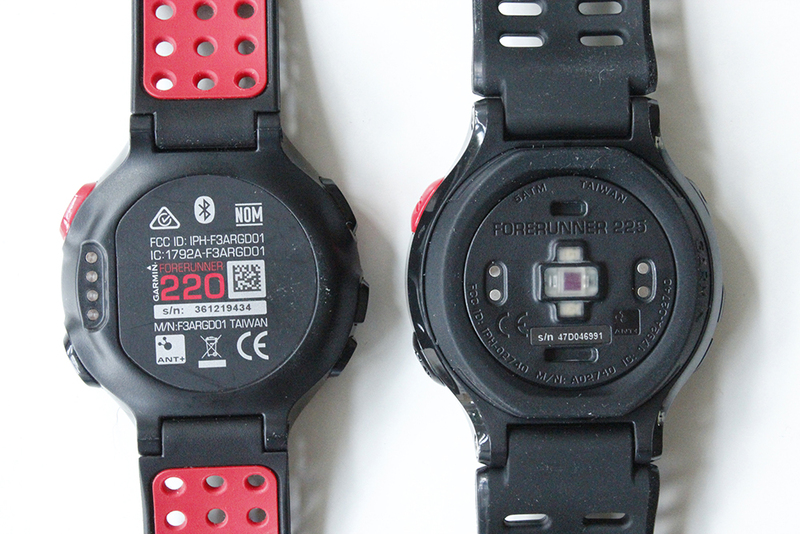 The main difference is that the Forerunner 225 (introduced Juli 2015) has a built in optical heart rate monitor, whereas the 220 (Fall 2013) does not. The 225 is a bit heavier with 1.9 oz (54 gr.) vs. 1.4 oz. (41 gr.) 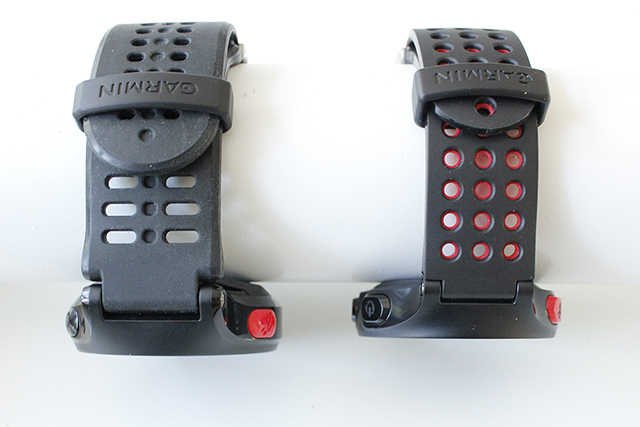 of the 220, which makes sense as it has the Mio optical HR monitor built in. The displays are the exact same size. Also, the 225 sits a bit higher on the wrist. Again, the height comes from the optical heart rate monitor. 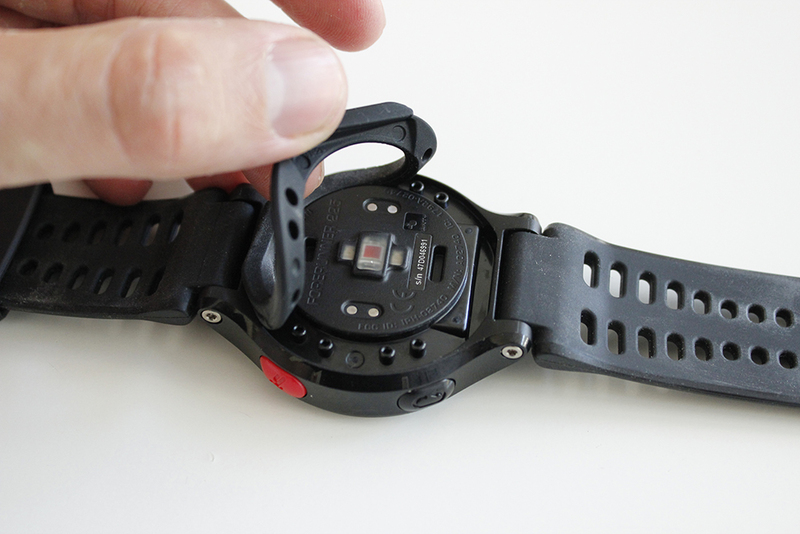 The heart rate monitor is also supported by a small rubber ring on the back of the watch. This prevents external light from creeping in and disrupting the measurement. The rubberband comes off easily when you want. 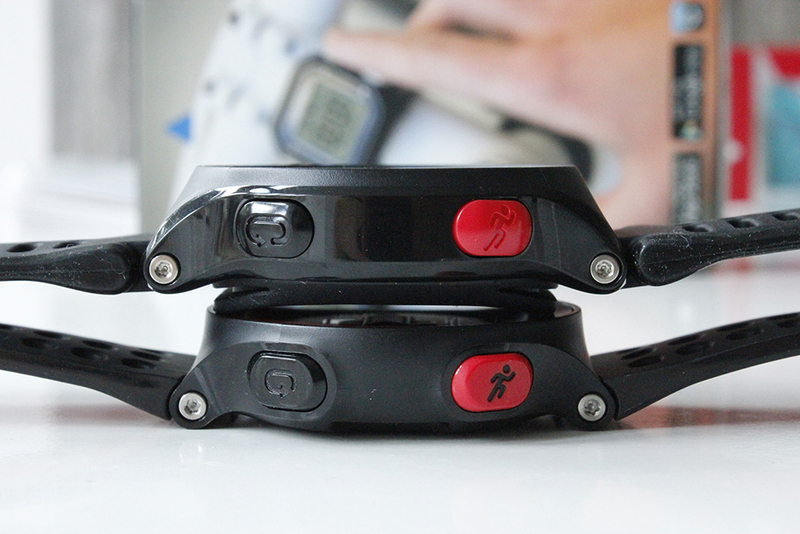 As the 225 has a built in, optical HR sensor, you don’t need a chest strap or other HR measuring sensor. However, if you want, you can use this. 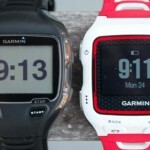 While both watches have Bluetooth, this is only used for pairing and syncing with your smartphone. Neither supports BT-sensors. 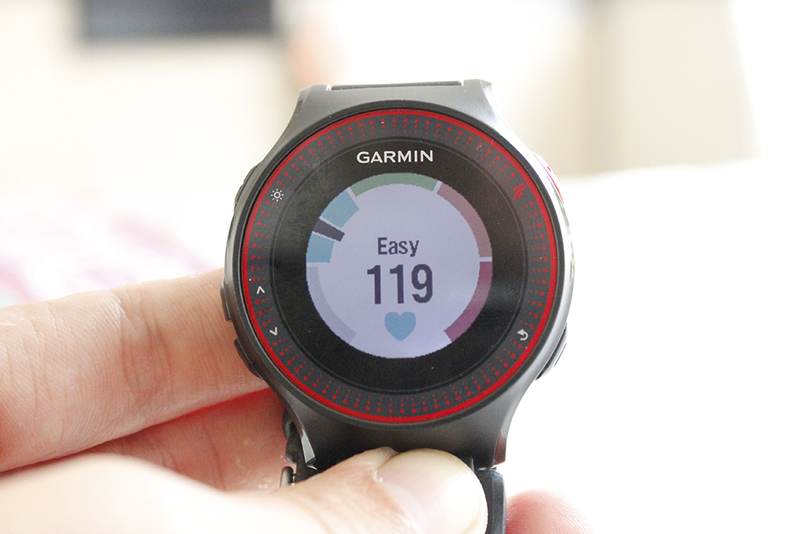 The battery life is interesting, because of the activity tracking abilities in the FR225 it’s normal battery life is a bit shorter, up to four weeks, whereas the 220 can go up to six weeks. However, during training the battery life is identical. Up to 10 hours. For the 225 this means they saved energy somewhere as the LED’s use some energy. 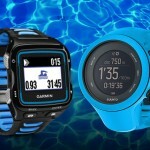 The displays are identical being 180×180 pixels and 1.0″ (25.4 mm) in diameter, however, the new Forerunner 225 comes with a new build in display, the HR-Gauge. This is a nice feature for the visually oriented runner. 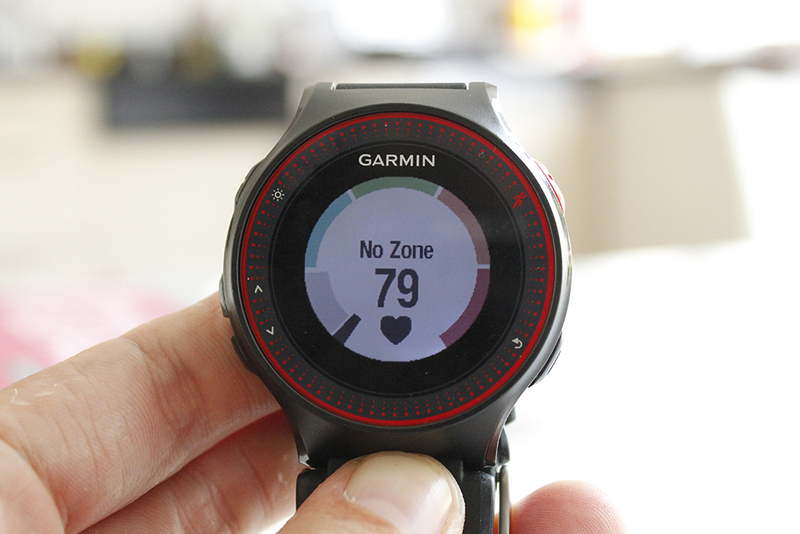 With the gauge you get an instant reading of your HR, as in, what zone you’re running in. If you’re not already running on heart rate, or you are tired of using the strap, the optical reading might be the way to go. You can go on a run whenever you want, you don’t have to remember to bring your HR strap, or wash it. Accuracy wise, it might be off sometimes, but I’ve had similar experiences with HR-straps and in the end the readings are well within an acceptable range of difference (less than 2%). In this table I only show the actual differences between the watches. Everything else is exactly the same. As always, I automatically try to find the best prices online for you based on your location. In return, if you want to buy one, please use one of the links, I get a small fee for it. Incase a price is wrong, or your favorite store is not here, let me know, I’ll try to add the store to my system.